Gorey Family Chiropractic Clinic was founded as a center of excellence in Co. Wexford for the treatment and management of disorders like sciatica often seen with new clients as a result of a prolapsed disc or other spinal problem causing irritation or pressure to the the sciatic nerve. A pinched sciatic nerve can cause significant back and leg pain, restricted movement and can also cause pins and needles and numbness in particular areas of the leg. If you suspect you may be suffering Sciatica, our internationally trained and highly experienced team are well positioned to help you. An initial consultation which includes careful evaluation of your history combined with a thorough physical examination including orthopaedic and neurogical tests is carried out to confirm a diagnosis of Sciatica or other spinal problem. If clinically neccessary X ray's of your spine can be taken on site to assess your spine for any damage that could be contributing to the development of the Sciatica. Occasionally we may refer patients with sciatica for M.R.I again if clinically neccesssary. Once a diagnosis of Sciatica has been established we can discuss and advise our clients on the most effective treatment options for the sciatica. 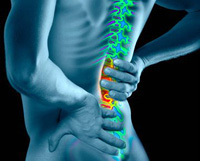 Our experts will guide your overall recovery making every effort to help you recover speedily whilst giving consideration to correcting and stabilising the underlying root of the problem to avoid a repeat scenario of the Sciatica at a later stage. If it is felt that Chiropractic treatment or rehabilitation will not benefit your particular Sciatic condition we will communicate with your G.P and arrange appropriate onward referral. Based in Gorey, Co Wexford, the Gorey Family Chiropractic Team treat, manage and advise clients from all over the South East including Wexford, Wicklow and Carlow. If you are in need of Sciatica treatment or diagnosis in Wexford, Wicklow or Carlow please call 053 94 83338 or email info@chiropractor.ie for further information. For your convenience all of our clinical team are registered with VHI, Aviva, Laya and Glo healthcare and are eligible for reimbursement from the Garda Medical and the GAA Player Schemes.